Wymark is well down the cast list as prison inmate Sol, in this 1960 movie written by Alun Owen and directed by Joseph Losey. The movie stars Stanley Baker as Johnny Bannion and Sam Wanamaker as his criminal associate Carter. Bannion enjoys the briefest release into the outside world, just long enough to carry out a robbery, before ending up back in prison under the malevolent gaze of head warder Barrows (Patrick Magee, The Plane Makers William Breen). 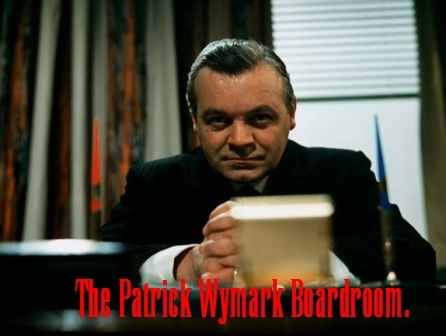 Despite playing a minor role, Wymark actually appears in the opening scene, playing a tense game of cards for tobacco with fellow inmate Antlers (Murray Melvin). The fact that the first two characters to speak are Melvin (from Joan Littlewood's theatre workshop) and Wymark (then fresh from the 59 Theatre Company) suggests that Losey was trying to get away from the usual run of casting. Like most of the characters in the film, Wymark's Sol is slightly grotesque; an aggressively cheerful Yorkshireman who forms part of the Hogarthian mass community of prisoners.Sol has a grandiose way of speaking, advising another prisoner that,"on a preliminary evaluation of the facts," his lawyer should have made a please of guilty, "which would have halved your sentence and would have halved his fee." The Criminal was made for Merton Park, producers of the Edgar Wallace and Scotland Yard featurettes. Like Losey's later production for Hammer, These Are The Damned, the movie depicts the struggle of a corrupt establishment to contain eruptions of disorder: both movies begin with a coded song:"Black Leather Rock" in These Are The Damned , and John Molloy's "Nick Nack Paddywack"in The Criminal. Both songs lead to an eruption of violence. In both movies, the establishment tries to manipulate events to suit its own purpose. Both movies end on a note of hopelessness with a helicopter shot abandoning the heroes to their fate. Baker portrays Bannion as a dominant professional, calm on the surface but increasingly troubled as he realises he's being manipulated. Fans of irony, or synchronicity will note that Sam Wanamaker's effete gangland executive shares a surname with Carter, the New York manager of "The Outfit" in Richard Stark's 1962 novel The Hunter. Both Carter's share a similar philosophy; in the novel Carter explains to aggrieved robber Parker that "The Outfit" can't just hand over the money he demands because it is run on business lines. In the movie, Sam Wanamaker tells Baker that, "Your sort doesn't fit into an organisation.We can't just have you running about messing things up." The movie also features a characteristically quirky and ambiguous performance from Patrick Magee as Chief Warder Barrows. Even at the end it's never clear if Barrows is on the take, playing an establishment long-game or just insane. As the prisoners begin making noise to conceal the mob violence against an informer in the opening act, Barrows joins in, clanking his keys against the bannisters of the staircase as if acknowledging that the management will let them get it out of their system, as long as the wider running of the prison continues unimpeded. Barrows is the worst kind of line manager, ready to manipulate and betray his subordinates in pursuit of his wider agenda (When young warder Edward Judd confirms that he put Bannion in a cell with two thugs ready to deliver a beating, Barrows tells him he said the opposite. When Judd says he made a note of it, Barrows tells him,"You made a mistake").It's interesting to contrast Barrows with Magee's performance as Joseph Breen in The Plane Makers episodeThe Old Boy Network where Breen is equally happy to sack a worker to cover his own job. 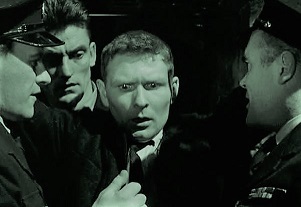 Warder Edward Judd* confronts Pauley (Brian Phelan) with a concealed knife as Snipe (John Molloy) and Barrows (Patrick Magee)watch. For all its reputation for radical film-making, the most striking effect in the movie is an unexpected theatrical scene where we and Bannion suddenly get a glimpse inside the mind of Pauley Larkin (Brian Phelan). Larkin has appeared to be among the more reasonable inmates, but as the camera closes in, and the lights dip on the background actors, Phelan delivers a show-stopping monologue. *Edward Judd later married Norma Ronald (Kay Lingard in The Plane Makers and The Power Game).